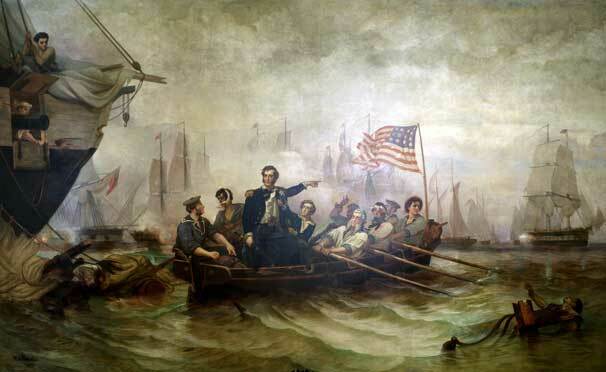 On September 10, 1813, Commodore Perry defeated the British fleet at the Battle of Lake Erie. A victorious Perry sent his famous message to his commander: "We have met the enemy and they are ours". Oliver Hazard Perry was the commander of American ships on Lake Erie. His mission was to gain naval superiority on the Lake. To accomplish that mission, Perry built two new brigs called the Lawrence and Niagara. Each weighed 500 tons, was armed with 18 32-pound carronades, and had two long-range twelve pounders. Perry also had captured the brig the Caledonia and seven converted schooners. On September 10, 1813 the British decided to engage the American fleet anchored at South Bass Island. The Americans had the advantage in terms of the number and weight of their guns. Each American vessel had been assigned an opponent, and after a number of hours of sailing the two fleets were within shooting distance. The Niagara and the Lawrence bore down on the British and forced them to surrender. Perry went on to report the words that made him famous- "We have met the enemy and they are ours. "